Is the area under your sink filled with bottles of cleaners? I know mine was. I had glass cleaner, kitchen cleaner, bathroom cleaner, disinfecting cleaners, de-greasers, and many more. We had a separate cleaner for every job in my house. But once we began researching natural cleaners and how to avoid adding chemicals to my home whenever possible, I learned that with a few household ingredients we can DIY all of this. On top of it any homemade all purpose cleaner ends up being much cheaper. I’ve put together a few all-purpose cleaners that work wonders at cutting the grease and dirt while disinfecting my home surfaces, and I’m going to share them with you here. We hope you’ll try them and choose your favorite for everyday use. You’ll save time and money while eliminating harmful chemicals from your home environment. This homemade all purpose cleaner with essential oils is good for cleaning just about everything. We use it a lot in the kitchen, shower, toilet bowl and bathroom. Even though it has soap in it, you don’t need to rinse it on most surfaces. The small amount of soap easily wipes up and doesn’t leave a film. On glass or very shiny surfaces, give it a rinse with a wet cloth. I like to mix this up in a quart spray bottle, preferably glass, and keep it on hand for everyday use. You can find Borax (not boric acid) and washing soda in the laundry detergent section of most grocery stores. I like to use distilled water to avoid leaving behind water spots. This disinfectant works better than bleach, without the worry of breathing in harmful chemicals. It is simply a mixture of equal portions of hydrogen peroxide and vinegar, but it must be made and used immediately since the disinfectant qualities don’t last over time. My preference is to keep 2 spray bottles: one of hydrogen peroxide and one of white vinegar. I spray the surface with vinegar and then peroxide and mix them together with a sponge or soft cloth. Leave them on the surface for a few minutes to do their magic. I use this to disinfect in the kitchen, bathroom, kids toys, and any other surface that I want germ free. Be careful with fabrics, hydrogen peroxide has a mild bleaching action. I am always a little cautious with vinegar-based cleaners because they can ruin some finishes, so always check your cleaning instructions before using vinegar. On the plus side, vinegar is an excellent degreaser, which makes it the perfect homemade oven cleaner. We like to use this cleaner for greasy surfaces, glass, and other shiny surfaces. Make this homemade multipurpose cleaner in a quart spray bottle and keep it on hand for general cleaning tasks. It will foam a little when you mix it, so leave a little room at the top of the bottle and add the water slowly. Vinegar is great to clean laminate floors and is the base ingredient for some of the best homemade floor cleaner recipes. This solution is great for removing grimy dirt. The combination of ammonia and laundry detergent is a powerful degreaser. Just be sure that your homemade liquid laundry detergent does not contain bleach. Mix all the ingredients in a quart spray bottle and give it a good shake. When you need a mild abrasive cleaner, look no further than baking soda. Its cleaning properties combined with the abrasive texture make it ideal for situations where a mild abrasive is needed. We mix baking soda with a little dish detergent to make a paste, then use it to scrub my appliances and sink. Rinse it off with a wet cloth. This recipe works very well as a powerful homemade glass cleaner. Give it a try. You’ve probably used baking soda as a deodorizer in your refrigerator for years. It is also good for deodorizing carpet, upholstery, shoes, and other smelly surfaces. Sprinkle it on and allow it to soak up odors, then vacuum it away. Vinegar is also a good deodorizer when a liquid is more appropriate. I like this deodorizer recipe to use for fabrics and upholstery. Be sure to test it first to make sure the vinegar won’t harm your fabric. Mix the ingredients in a spray bottle and give it a shake. I’ve already mentioned that I don’t like to use bleach in my home. However, some people don’t feel their counters are clean unless they use a bleach cleaner. If this describes you, then this recipe is for you. You don’t need strong bleach to do the job, a 10 percent solution works very well. You should make this cleaner fresh daily in a quart spray bottle or in a bucket. Don’t use dish soap for this recipe, laundry soap works just fine and won’t react with the bleach. I hope you’ll give these recipes a try and see how well they work for you. I think you’ll find that they clean as well as the commercial cleaners without the chemicals with unknown side effects. I find that the first two recipes work in almost every situation, so I keep them on hand all the time. 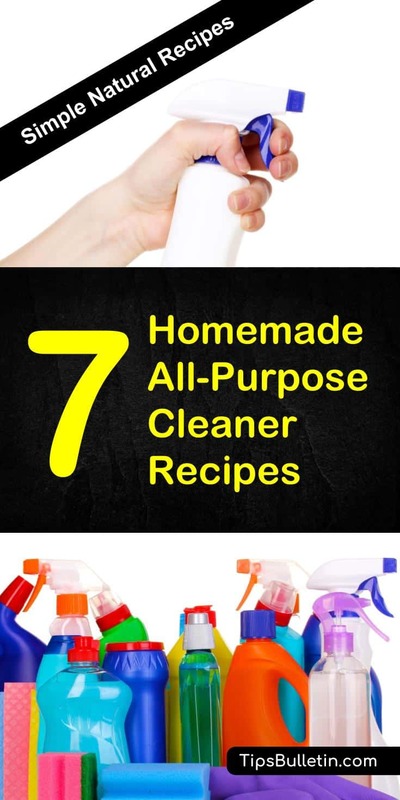 The rest are great when you need cleaners for special purposes. By using these cleaners, you can save money and the environment without giving up your cleanliness standards. 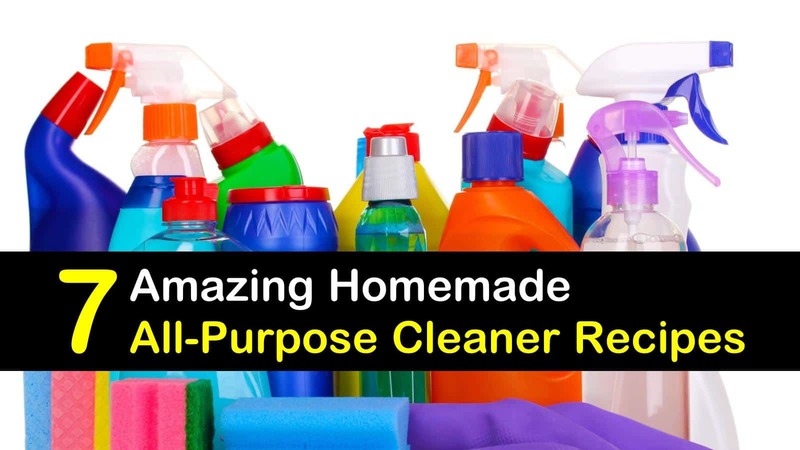 If you have a good homemade all purpose cleaner that works for you, we’d love for you to share your recipe in the comments. Also, you can help us out by sharing this article on your social media and passing it on to anyone who might need the help. We all benefit when we share our knowledge.